The "Renee" invitation is a layered square card in brown, pink and white colourings, featuring "Boudoir Pink" designer paper and matching printing. 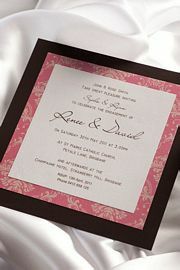 The "Enchantment" invitation is a romantic DL flat card in quartz and pink colourings. The invitation features designer paper bound in thin pink satin ribbon and embellished with a matching half pearl. 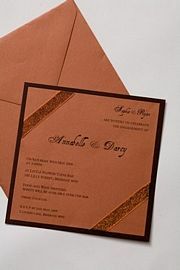 The "Tuscany" invitation is a modern mixture of earthy colourings on a contemporary square card with twin feature strips of matching satin ribbon. 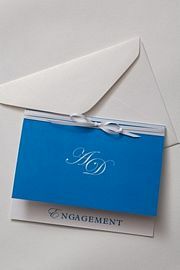 The " Sapphire" invitation is an elegant combination of blue and white in a C6 card, featuring a printed monogram and white satin ribbon. 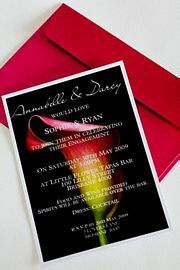 The "Lily" invitation is a C6 flat card that features a vibrant lily design as a backdrop for the invitation. 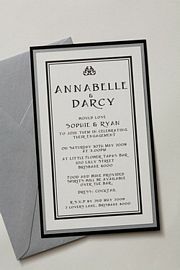 The "Chanel" invitation features a formal design using a rich combination of black, silver and white borders.